This bursting-with-flavors butter chicken recipe makes an exciting, yet fast, classy dinner. Greek yogurt along with garlic, cumin, lemon juice and garam masala makes a wonderful Indian-inspired marinade for the saucy chicken. Marinate a day ahead and let the flavors marry the chicken. Serve with rice or garlic naan. 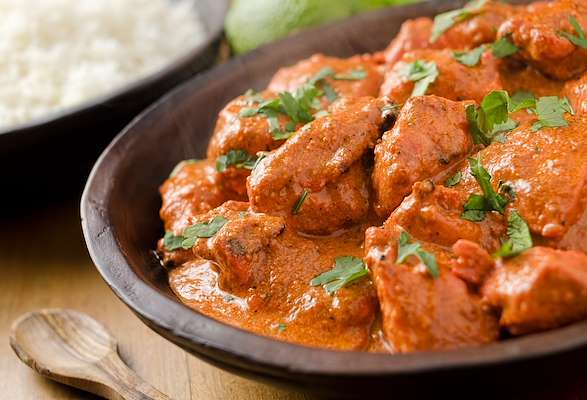 RecipeSavants.com This bursting-with-flavors butter chicken recipe makes an exciting, yet fast, classy dinner. Greek yogurt along with garlic, cumin, lemon juice and garam masala makes a wonderful Indian-inspired marinade for the saucy chicken. Marinate a day ahead and let the flavors marry the chicken. Serve with rice or garlic naan. Smart Recipes, Indian Recipes, Chicken,Dairy Recipes, Recipes Chicken,Dairy Indian Butter Chicken PT40M Serves 4 Ingredients: 1 Pound Chicken Thighs 15 Ounce Tomato Purée 0.5 Cup Natural Greek Yoghurt 1 Cup Heavy Cream 0.5 Brown Onion 1 Tomato 0.5 Red Bell Pepper 4.5 Ounce Cashew Nuts 0.5 Cup Chicken Stock 1 Teaspoon Lemon Juice 2 Teaspoons Corn Flour 2 Teaspoons Garlic 2 Teaspoons Ground Cinnamon 2 Teaspoons Ground Coriander 2 Teaspoons Paprika 1 Teaspoon Ground Cumin 1 Teaspoon Garam Masala 1 Teaspoon Chilli Powder 1 Tablespoon Butter In a large bowl, add chicken, yoghurt, garlic, lemon juice, garam masala, cumin and chili powder and mix well. Refrigerate for 4-6 hour or overnight. In a wok, heat oil and butter over medium-high heat and sauté onion until they just start to soften. Reduce heat to low. Stir in chicken with marinade, tomato purée, chicken stock, beans, bell pepper, tomato, flour, cashews, coriander, cinnamon and paprika and simmer for about 15 minutes. Stir in cream and simmer for about 10 minutes. Serve.